It is well-known that evidence of many eye diseases will appear at the cellular level long before such diseases can cause problems with vision. Therefore, any examination that will allow the early detection of these changes could provide an opportunity for earlier treatment, even before you notice changes in your vision. One such examination used by our optometrists to diagnose and treat many corneal diseases is known as Specular Microscopy. The cornea is the clear layer of tissue found at the front of the eye. It is the shape of your cornea, and its internal clarity, that determines the amount of light that reaches the retina (the part of the eye that changes light into nerve impulses that are interpreted by the brain) and how well the incoming light is focused onto the retina. In general, corneal disease is often preceded by changes in the shape, number, and size of the individual cells that, together, make up the cornea. These gradual changes have been extensively studied in volunteers of all ages and in those with, or without, evidence of corneal disease. Any observed changes in the cells that make up the cornea can thus be used to evaluate your cornea for the presence, or absence, of the earlier stages of conditions that might later affect your vision. Specular Microscopy is valuable in the long term follow-up of surgery involving the cornea, monitoring the potential changes in the cornea that may come with long-term use of contact lenses, as well as in evaluating the effects of prescription medications. As an example of the above, LASIK and PRK are the most popular “laser surgeries” for correction of both nearsightedness and farsightedness. Apart from differences in the surgical techniques used, both surgeries involve making subtle changes in the shape and thickness of the cornea to improve how well it focuses light onto the retina. 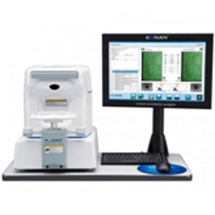 Specular Microscopy, by its ability to evaluate the cornea at the cellular level, is ideally suited to the detection of potential long-term changes in the cornea that may arise following either procedure. In summary, Specular Microscopy is a technique that allows the direct examination of the cornea at its cellular level. Our optometrists routinely use this technology as a part of their comprehensive eye care services. The fact that our optometrists at Eye Site include Specular Microscopy examinations as a part of your eye care demonstrates their commitment to providing you with the highest level of care in protecting your vision.